Below are the complete details of the Senior Legal Consultant jobs in Ministry Of Privatisation in Islamabad. Skills Required for Job: Having Good Communication Skills. Good Team Working Skills. Skills:- Listening, Speaking and writing & Analytical and Problem solving skill. 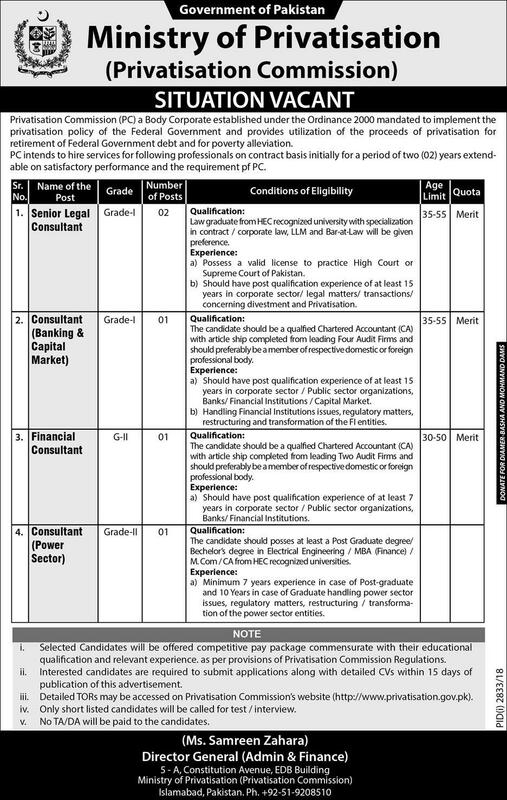 Qualification: Ministry Of Privatisation Islamabad Jobs For Senior Legal Consultant. Required Qualification: Law Graduate from HEC Recognized University/ Institution. Having 15 Years Experience in the Relevant Field. Age Limit: 35 Years or Maximum 55 Years. Attractive Salary Package. 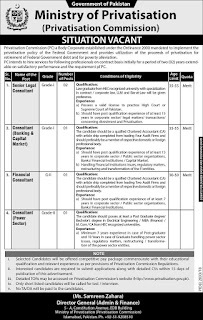 Senior Legal Consultant jobs in Ministry Of Privatisation Islamabad, in Pakistan published on Paperpk.com from newspaper on December 25,2018. Job seekers who are already working as can also apply for post of Senior Legal Consultant.